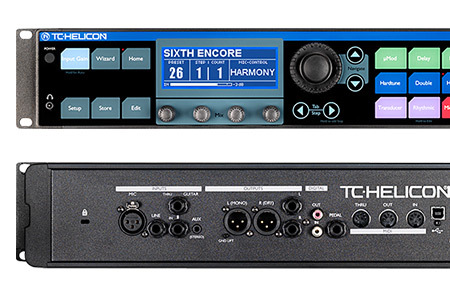 Back in November, Craig from TC Helicon sent us one of their new products the VoiceLive Rack, to try out and review. I got to play with it first and here’s what I thought of it. The VoiceLive Rack is the latest vocal processor from TC-Helicon, a company who have a long history of building excellent harmonizers and vocal effects. The VoiceLive is a complete vocal processor for live and studio use with eight effects such as delay, reverb, harmony, in addition to the global tone control and chromatic pitch correction. This is the bigger brother of the VoiceLive Touch, TC-Helicon’s mic stand-mountable vocal processor. It has many of the same features but with more in-depth control, and more i/o options. Physically the VoiceLive Rack is a shallow 2-space rack. The top and bottom panels have a curved finger groove making it easy to move the Voicelive around when not in a rack. On the front panel there is large, very bright backlit display, 5 rotary encoders, an 1/8″ headphone jack and power button. The majority of the front panel is covered by a large touch sensitive interface. The rear panel includes a wide array of i/o options. From left to right, XLR mic input, 1/4″ Line input, Guitar input and guitar thru, 1/8″ stereo aux input. The output are stereo on XLR and 1/4″ TRS. A ground lift is available for the XLR outputs. Next there are S/PDIF in and out on RCA jacks, a footswitch jack, 3 MIDI ports – Thru, out, in and lastly a USB port. Also in the box is the MP-75, a phantom powered handheld dynamic mic. The MP-75 features the mic-control button which can be used to activate various functions on the VoiceLive Rack or other TC-Helicon processors. In general, this would be most useful when configured for bypassing all effects, but if you need one effect on all the time, like reverb and want harmony or a big delay in certain parts of a live performance, you can set the mic-control button to activate one of the other effects. You can set mic-control to a global function or independently for every preset. The VoiceLive rack has a built-in mic preamp with phantom power and 66dB of gain. I used the Voicelive rack for a few podcast episodes along with the MP-75 and sounded pretty good, maybe a little thin for my speaking voice but it was clear and background noise was much lower than with my usual condenser mics. In addition to the touch controls, there is a large rotary encoder Jog Wheel to cycle through the presets in “Home” mode or through menu options in any of the edit pages, and four smaller parameter knobs for menu editing. The caps on these encoders are black and rubbery, they move easily and feel solid enough despite not being rigidly mounted. Booting up the VoiceLive Rack takes about 15 seconds, after that everything loads instantly. There are 400 preset slots, 238 were filled when I received the review unit. Empty preset slots are hidden until the store button is pressed. Preset changes are instant with either the large rotary or the up/down arrow buttons. Pushing and holding the arrows scrolls through the presets quickly. I found the VoiceLive intuitive to use, I didn’t need to look functions up online or in the manual, actually I didn’t read the manual at all even for doing things like configuring the digital outputs. I think the average user would be able to get this running without much effort. Pushing the Wizard button to the left of the display brings up a two page menu. The first page, Find, lists all the presets 8 at a time, You can scroll through with the Jog wheel. You can filter this list by selecting 3 tags. Switching over to the next page, Tag, allows you to assign a variety of tags to the selected preset. All the factory presets are already configured with tags. This makes finding suitable presets really fast. For example, if you were looking for a patch with distortion and short ambience, the list gets narrowed down to 7 presets. Touching the wizard button again will load the selected preset from the filtered list. The Tone button on the far right gives you a pre-FX EQ, compression, DeEssing and gating for the vocal input. The chromatic pitch correction is also a global effect. This actually sounds pretty decent, I ran some recoded vocals through this that were already tuned but needed some pitch drift tightened and it came out fairly well. In the studio it wouldn’t completely replace a tool like Melodyne or Autotune but might actually save a lot of time when recording background vocals, having them all in tune at the preamp. Besides the EQ and dynamics processors found in the Tone section, there are eight fully configurable effects: uMod, Delay, Reverb, Hardtune, Double, Harmony, Transducer and Rhythmic. Most of the effects have a large variety preset styles to get you started with the effect. The harmonies can be automatic or follow the guitar or MIDI inputs. OK, enough talking. Let’s hear what it actually sounds like. I have a bunch of examples to show off some of the cool things the VoiceLive Rack can do. I used the VoiceLive on a mix to thicken up some vocal parts. I sent the vocal track out of the interface through s/pdif and back in on a new track. In another part of the song I used a doubling preset. I used some vocals from this 30 Seconds To Mars cover. First the dry vocal then through a few presets I thought worked well. The last example is one of the weirdest presets using an echo and the rhythmic effects. In the few weeks I played with this in my studio I had a lot of fun with it but didn’t find it to be something I absolutely needed. If I was a vocalist that wanted studio quality effects live, in a powerful, intuitive box, this would be a no-brainer. If you sing and don’t trust the sound guy to get your effects right, GET THIS.